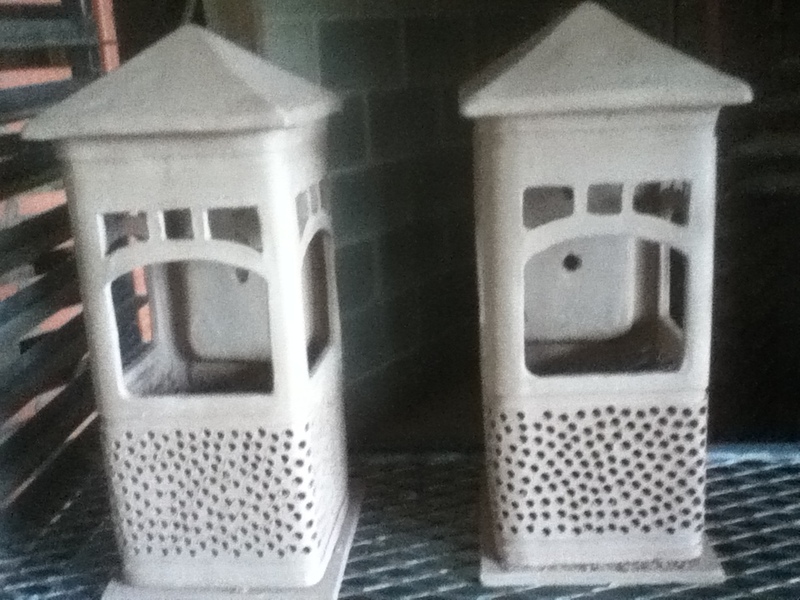 Two unglazed, unfired craftsman sconces are drying on a shelf and waiting to be glazed and loaded into the kiln. 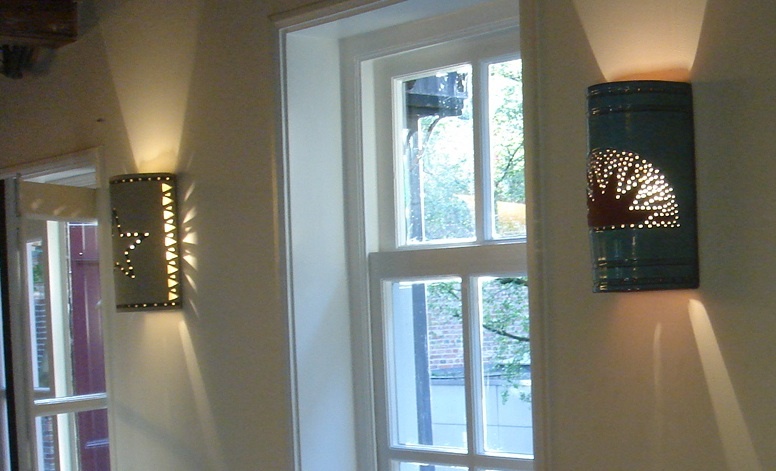 We will post photos of the sconces after they have been glazed red-brown, fired and fitted with art glass windows. The Grackle is an unavoidable part of the soundtrack and setting of Austin, Texas. 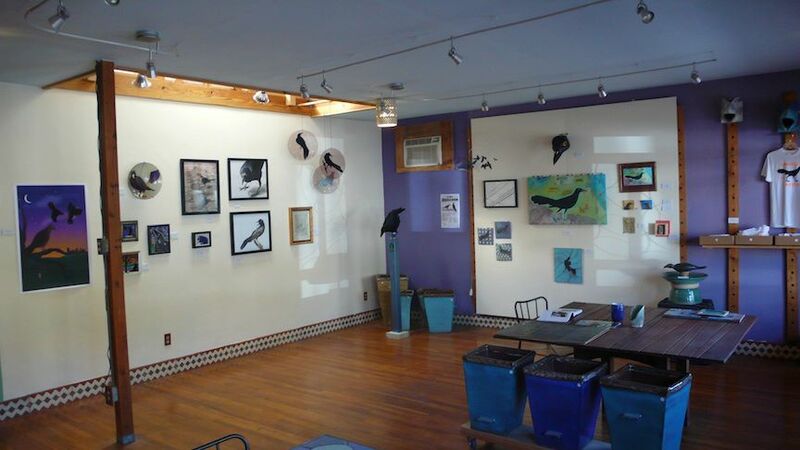 When we at Clayworks first began to explore the idea of a Grackle theme exhibit to kick off our annual East Austin Studio Tour show, we wondered whether anyone besides ourselves found the ubiquitous bird an inspiration. We began asking around and discovered that a number of Austin artists had been contemplating or even making Grackle art for a while. Kathleen Ash, Barbara Lugge, MAKEatx, Caroline Wright, Aly Winningham, Susan Wallace, Lyon Graulty, Stewart Gray, John & Chris Gray, Barbara Attwell, Ellen Gibbs, Phillip Wade, Carly Weaver, Melody Lytle, and Fran Berry. 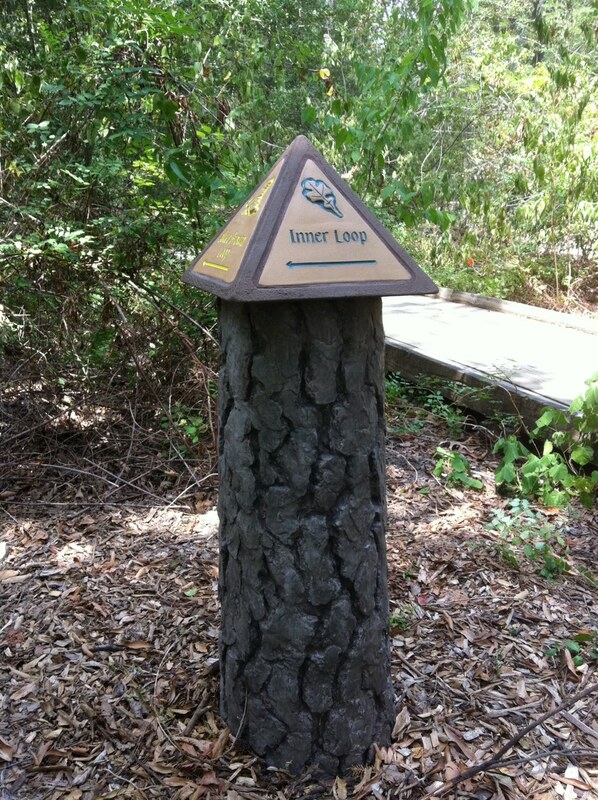 The Trailmarkers are mounted atop sculpted concrete tree trunks. 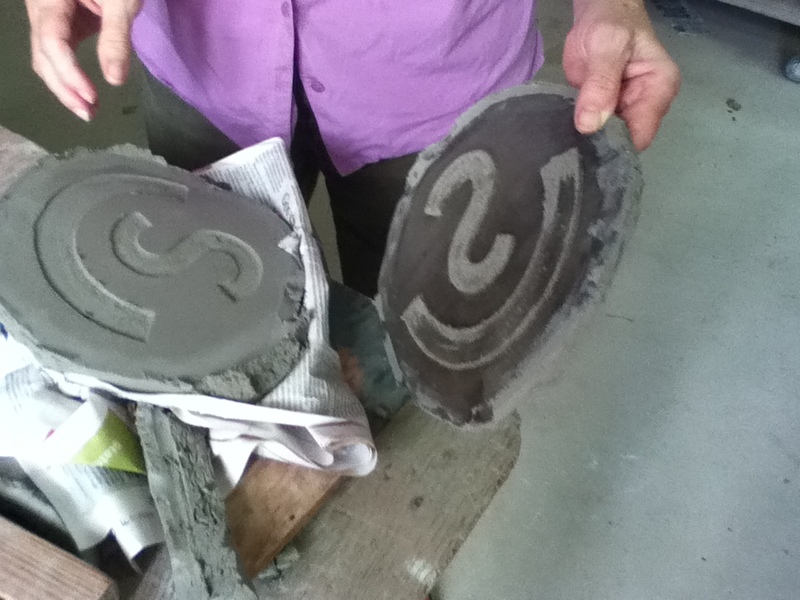 Wayfinding tiles for the Houston Arboretum and Nature Center, a project that came back to us after years of delay due to the destruction Caused by Hurricane Ike. 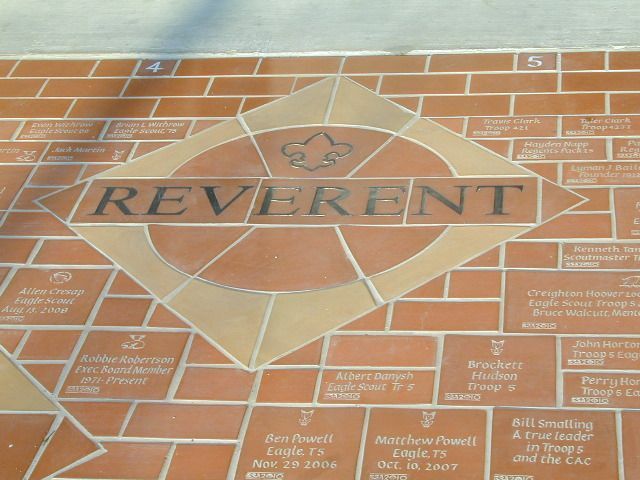 Pavers inscribed with the names of donors and stamped with Boy Scout insignia surround the twelve Scout Law murals. Inscribed donor tiles for the new Scout Training & Education Center in North Austin. Along with hundreds of donor name tiles stamped with scout insignia, we made a dozen Scout Law murals. A 30-in. 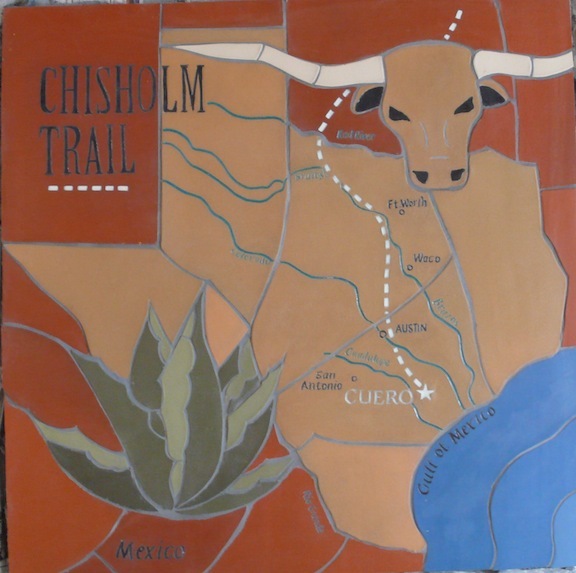 square floor mural for a museum courtyard showing the path of the Chisholm Trail from Cuero northward. 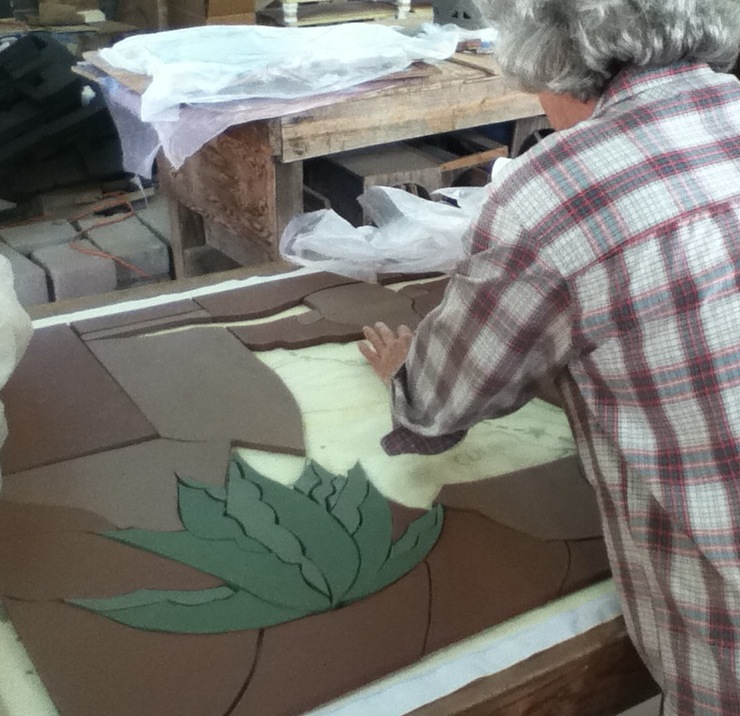 The colored clays which make up the mural were cut to shape while soft. 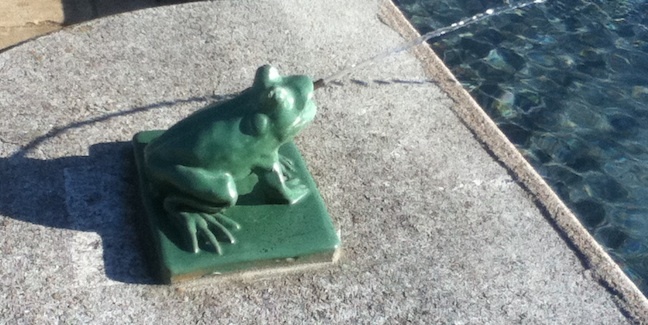 Replication of clay frog spouts for a fountain on the grounds of the Perry Mansion, an Austin estate currently undergoing an extensive renovation. 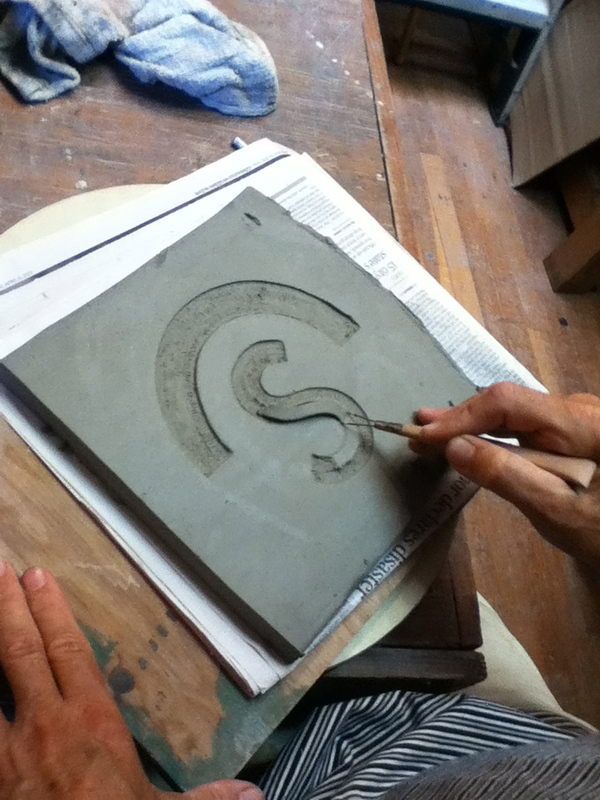 And there’s been the steady flow of bread & butter work–hand inscribed donor pavers for schools, churches & libraries; individual address plaques made to order and sconces of all descriptions for homes and public spaces. Here’s the finished Chisholm Trail Museum mural, all set and grouted, ready to be picked up. 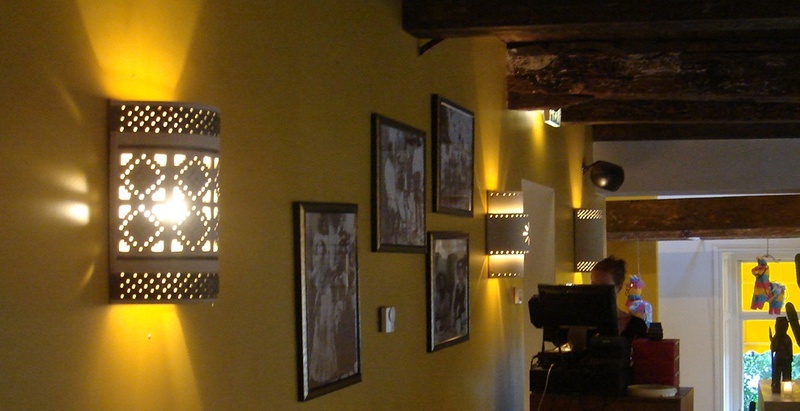 Robert Anderson Landscape Architects contacted us a few months ago for a 30-in. square floor installation for the museum courtyard showing the path of the trail from Cuero northward. Museum Director Robert Oliver provided a map of the trail. 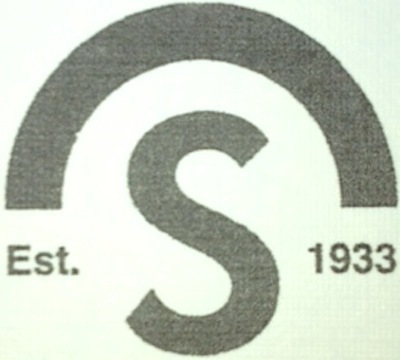 We started with a pencil layout, and once it seemed right converted it into a computer image. 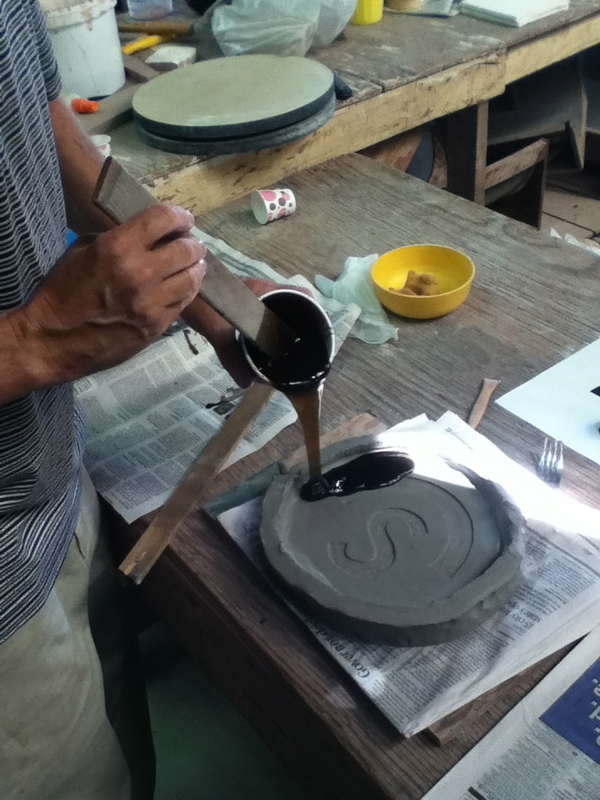 The pigmented clay we sometimes use is generally mixed by hand. 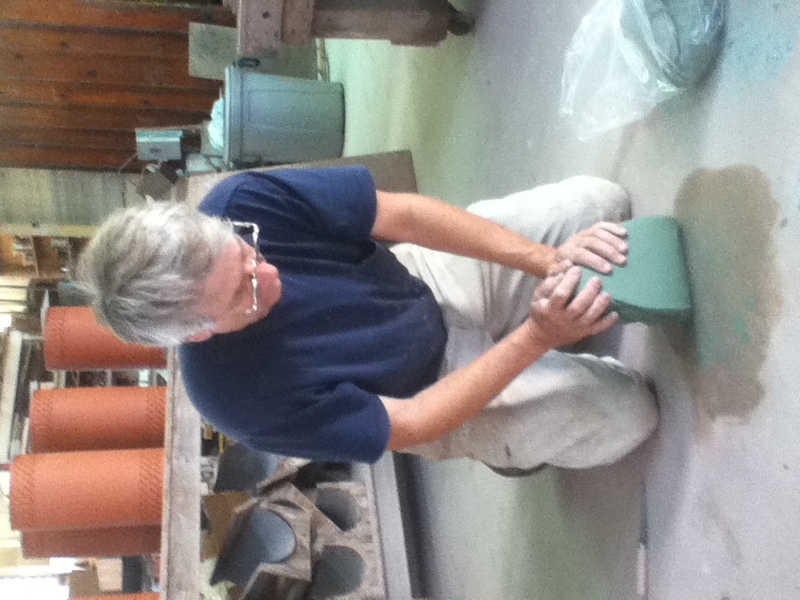 John is wedging green clay–pigmented with chrome–for a floor medallion. 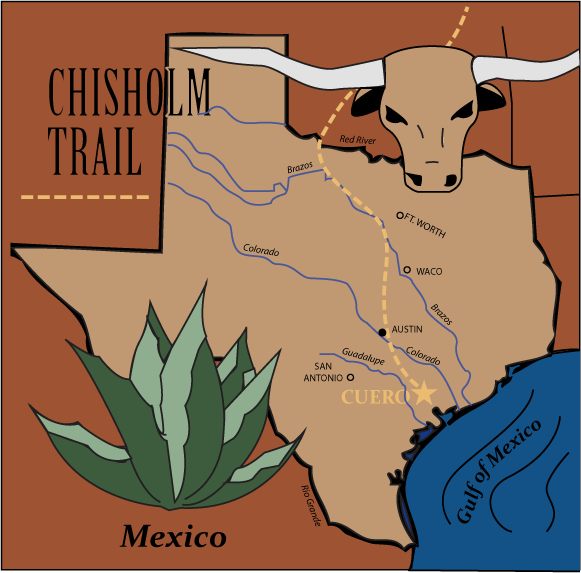 This is the design for a 30-in square courtyard floor mural we’re making for the Chisholm Trail Museum in Cuero. 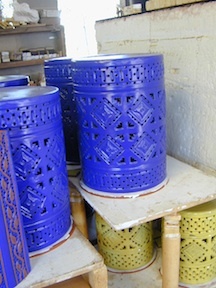 The pigmented clays we are using are colored throughout rather than glazed on the surface, so that foot traffic can never wear the color away. 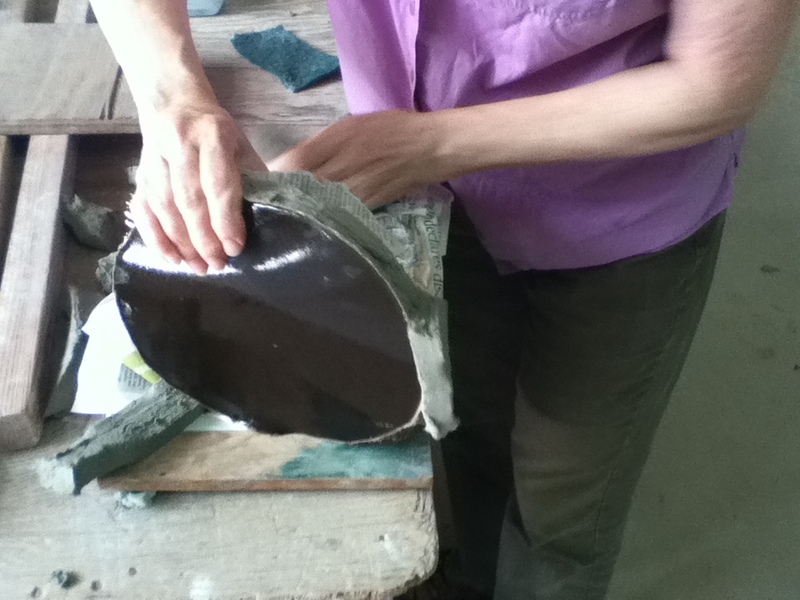 There are five different clays: terra cotta, buff, white, green and blue. 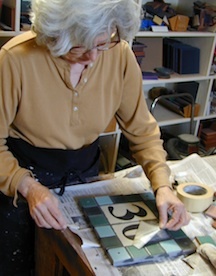 The next step in the process is to enlarge the pattern, then roll out slabs and cut out the shapes.